Vine cuttings can be matched to various soils and regional characteristics of other countries, enhancing the complexity and finish of a wine. With practically every significant pinot noir producer in New Zealand available in Hong Kong, my advice is to be adventurous in your selection, as you will not come across a bad wine, with quality high across the board. Rather, it is a question of budget or regional style and above all, what appeals to your taste. There is a broad range of price points with the more affordable commercial styles usually attributed to higher yields and the economies of scale of larger wineries in the Hawkes Bay, Gisborne and Marlborough regions. Secondary labels made by top producers also offer good value. Intended for immediate consumption, these wines are made primarily of non-estate purchased fruit, or declassified fruit from young vines and parcels not deemed worthy for their best cuvee. The Main Divide label from Pegasus Bay winery in North Canterbury is an excellent example. 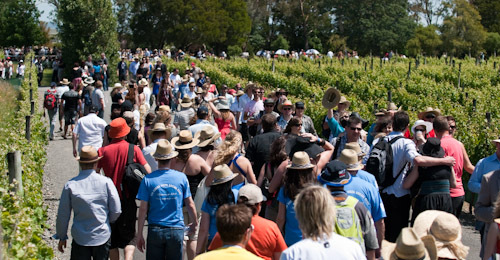 Dominated by dedicated smaller producers, the wines from the prominent pinot noir regions of Martinborough, Marlborough (the exception), Nelson, Canterbury, Waipara Valley and Central Otago sell at a premium, which is warranted given the yields are significantly lower and the viticulture more labor intensive. In fact, a large proportion of vineyards have adopted organic and biodynamic methods, in keeping with both New Zealand’s clean and green image and a growing practice among top pinot noir-producers around the world. In terms of production, Marlborough is by far the most substantial region where large-scale grape growers and bigger wineries coexist with small vineyards, making it more difficult to interpret a clear regional style. The complex and powerful wines from Fromm Winery and Foxes Island demonstrate the region’s capabilities well, that is not to say the larger producers are less important or dedicated, indeed they have contributed enormously in propagating the strategic new clones that have transformed New Zealand pinot noir. Expanding on this, in the viticultural context, cloning is where cuttings or buds are taken from selected vines and propagated by nurseries. Different clones from varying countries or regions can be matched to soils and regional characteristics, greatly enhancing the complexity and quality of the finished wine. It may sound reasonably straightforward, however it is not an exact science with experimentation often taking a decade with no guaranteed results. The most popular and superior pinot noir clones come from Burgundy, often referred to as “Dijon” clones. The first clones of pinot noir introduced to New Zealand were from Switzerland and Champagne, France and did not perform that well and have been largely replaced by Dijon clones that became available in the 1980s and 1990s. Abel refers to Malcom Abel, the diligent New Zealand customs officer who discovered and confiscated the said vine cuttings when a certain individual attempted to illegally smuggle them in to the country. As it turned out, Abel had more than a passing interest in vines, being a vineyard owner and instead of destroying the cuttings he quietly processed them through the correct channels and quarantine facilities. Gumboot refers to where the vine cuttings were uncovered by Abel and obviously the offender knew a thing or two about pinot noir, as the cuttings were apparently pinched from DRC (Domaine de la Romanee-Conti) Burgundies most famous vineyards. Ata Rangi is the Martinborough winery that acquired the propagated cuttings from the Corbans nursery and it remains one of their most favored clones, along with other Dijon selections. Within this flourishing pinot noir sphere, there is a tendency for the wine press to be preoccupied with new labels and latest discoveries. However, as an introduction to New Zealand pinot noir I would like to highlight some of the benchmark producers who have a well- established track record and are instrumental in defining regional styles. Starting with the best, not only is Ata Rangi unquestionably the benchmark of the Martinborough region, it is the yardstick for all New Zealand pinot noir, if not the New World. This is pinot noir in its most profound expression, the symmetry between power and elegance and seductive opulence hard to match from anywhere in the world, even Burgundy. Ata Rangi means “new beginning” in Maori and well describes how it began in 1980 when a barren five-hectare paddock purchased by Clive Paton took on a new lease of life as one of the first vineyards in the Martinborough region. Created by ancient rivers, these free-draining shingle terraces run some 20 meters deep, covered by shallow silt-loam and are perfect for pinot noir, to the displeasure of the local sheep. With the lowest rainfall in the North Island, coupled with the lean, stony soils and a fierce cool northwesterly in spring, yields are very low. I recently enjoyed a bottle of 2004 Ata Rangi Pinot Noir as an after dinner tipple with friends, all of us content cradling and inhaling the contents of our glass as if it were a fine old cognac. At the same time I contemplated it with duck Teo Chew style, slowly braised with dark soy sauce and five-spice. I have reduced my tasting note at the time by two thirds, as it looked like a pinot noir thesaurus. Intense, voluptuous nose of black cherries and blueberries, deepening to stewed blood plums and rhubarb, with cinnamon spice. A second wave of dried herbs, pipe tobacco and mocha among gunflint and toasty oak seduces further. Plush, sweet and sour saturation of small berry fruits building to layer upon layer of creamy lushness and Christmas pudding richness; chocolaty mid-palate with more mocha with the sweetness giving way to a herbal end-palate, oscillating between warming spices and cold iron acidity. There is a refined sinewy structure throughout the wine, tempering its opulence but not intruding on its silky texture. 2004 is the current vintage available globally, although the Hong Kong importer has both the 2001 and 2002 vintages available at HK$550 per bottle. Perhaps the details of the pinot noir celebration in New Zealand next year will stir further interest in a glass of seductively perfumed and opulent kiwi pinot noir.